NPR's Ari Shapiro talks to Reuters reporter Ayla Jean Yackley about the attempted coup in Turkey. 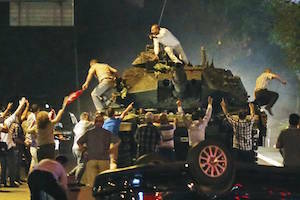 The Turkish prime minister said there has been "an attempted uprising from within the military." It is unclear who is in control of Turkey at this moment. The prime minister has told a television network that there is an uprising within the military, this in a country that has a history of military takeovers. There are reports of tanks and soldiers in the streets of the capital Ankara, as well as major roads closed in Istanbul. We're joined now by Reuters reporter Ayla Jean Yackley, who is in Istanbul. Welcome to the program. AYLA JEAN YACKLEY: Hi, thanks for having me. SHAPIRO: What is the latest that we've heard from the country's leadership? YACKLEY: The last message that we got was from the military, in which they issued a statement on their website, as well as an email saying that they had taken control of power, that they were now in charge. After that, we had a report from the state's news agency that members of the senior military leadership were being held at the General Staff - held against their will at the General Staff headquarters in Ankara. So prior to that statement, we had the prime minister go live on a private news channel and say that there had been an attempt at a coup, but he stopped short of saying that it was - that it had succeeded. So we have - there is some confusion at this moment about who exactly is in charge. SHAPIRO: There have been so many reports in the last six months about Turkey's military gaining power and strains with the civilian leadership. What is leading up to this upheaval? YACKLEY: For a year now, Turkey has been - the Turkish military has been actively engaged in conflict with the Kurdistan Workers' Party, an outlawed armed Kurdish autonomy-seeking group. That has really changed the dynamic here in Turkey. The military is a much more present force, just by virtue of the fact that it's battling this armed insurgency. And that has really pushed them to the forefront. But we haven't actually seen much in the way of open conflict or tension between the government and the military to date. I think that most people in Turkey are extremely surprised by what's happening tonight. SHAPIRO: Do we have any idea whether this apparent uprising within the military is a few low-level people or senior leadership? YACKLEY: It sounds initially, and, again, this is based on reports that the senior military leadership is being held, the chief of the General Staff namely, Hulusi Akar, is being held against his will at the military headquarters. That would suggest that no, it's not the leadership, which in fact seems to have, from everything that we can discern, has had good relations with the civilian government to date. So it could be lower level, but honestly it's so early. The story is unfolding as we speak, so it's difficult to say who actually staged this coup. SHAPIRO: And we will have a lot more on the story as the evening continues. Reuters reporter Ayla Jean Yackley speaking with us from Istanbul on reports of an attempted uprising in Turkey. Thank you very much.